We appreciate all that our race sponsors do to help us improve runner experiences at the Eversource Hartford Marathon and Half Marathon. With Mazda as the official vehicle of the race through our participation in the USA TODAY Sports Active Alliance marathon series, there are some cool perks that owners of Mazda vehicles can take advantage of. When picking up race bibs on Thursday or Friday at the Total Fitness Expo, Mazda owners can stop in the Active Alliance booth to receive mini massages – perfect for helping you loosen up for race day! Mazda owners can park their ride for free at One Financial Plaza in Hartford (see parking map for location and direction details). Spots will be pre-paid for Mazda vehicles on race morning. If you’re not a Mazda owner, come find out what it’s like to be one! Test drive a Mazda vehicle during expo hours outside the front of the XL Center. Check back on the blog for more perks announced through race week – and thanks for running with us! While you are at the Total Fitness Expo, take two minutes to do some good for Connecticut Children’s Medical Center, thanks to Total Fitness Equipment, a great local company and sponsor of the expo. Throughout the Expo on Thursday and Friday, hop on a piece of equipment for two minutes at the Total Fitness Equipment booth to earn a 50 cent donation to Connecticut Children’s Medical Center. You’ll be guided on how to use the best in fitness equipment and help a great local cause. You can also participate in any one of multiple mini-sessions to raise donations at the Expo. 5-minute sessions will be offered including Spin class, HITT class and Helix lateral training classes. Meet the experts and ask your cross-training questions to Pete Asadourian, Owner of Future Fitness Sport Specific, and Gina Valles, instructor and owner of Gina’s Total Fitness. Watch some amazing local athletes on Friday from 11:30AM-1:30PM at the Expo when Trinity College men’s and women’s row teams compete in mini-races using WaterRowers. Learn technique, get instruction and watch the competition, all in the name of a good cause. And, don’t forget to participate in the raffle for a free Cascade indoor bike! 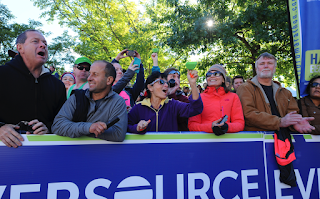 They’ve supported you through the training and are going to be cheering you on at the Eversource Hartford Marathon, so let’s help spectators make the most of enjoying your race day too. Make sure to provide them the link to the “Finding Your Runner” blog, it details all of the tips on where to be and how to get there on the half and full courses. And, best for spectators to download the mobile app and set up athlete tracking early – it can take up to 48 hours to set up tracking. A great new area for spectator celebrating, PowerStation Events Final Turn will be set up on the corner Pearl and Ford Streets. With its own stage and entertainment, the Final Turn will provide a huge party area featuring live music from the band Kick. -Frankie’s - Hot dogs, fries, onion rings, etc. Runners are generous and dedicated, often racing on behalf of other people and causes. More than $6.35 million has been raised through the Official Charity program at the Eversource Hartford Marathon since 1994. We know that many of you run for other causes too, and we want to give you credit for those efforts!! Please left us know if you’re running for charity on October 8 so we can add your efforts to the total for 2016, it’ll just take a moment to sign up here. 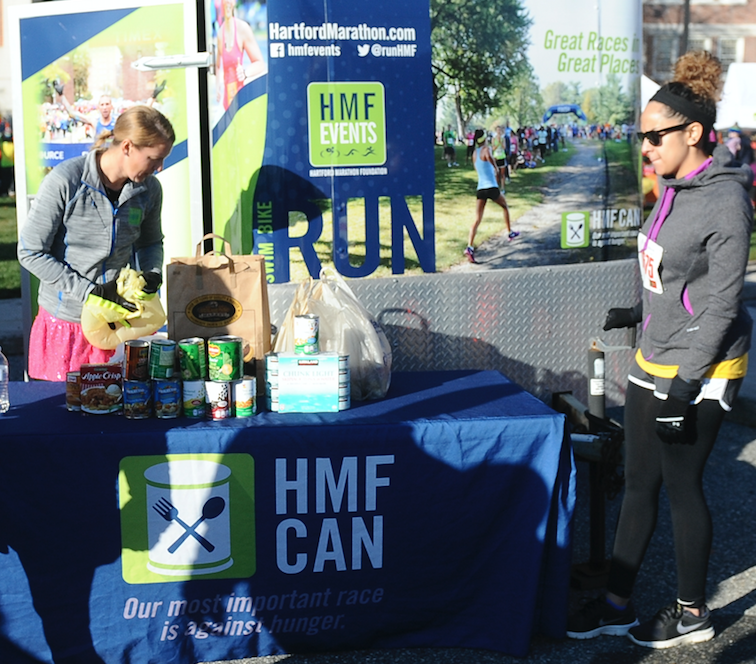 There are many ways that runners can help others on race day, it can be as simple as a box of pasta and couple cans of soup! 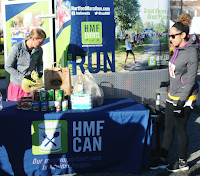 Through the generosity of runners at HMF events, more than 10,000 pounds of non-perishable food was donated to local food banks through HMF Can race-day collection trailers in 2015. You can help make an even bigger impact in 2016! Please bring non-perishable food donations to benefit FoodShare of Greater Hartford. Collection bins will be located at the Total Fitness Expo in the XL Center from 11:00 am - 7:00 pm on Thursday, October 6, and Friday, October 7. Race day collections will also be taken at bins in Finish Line Expo at Bushnell Park. The pink jean machine is back at the Finish Line Expo in Bushnell Park! For every $10 donation, get a new pair of Authentic Amethyst jeans, available in many styles for men and women. 100% of proceeds benefit Foodshare of CT and the CT Food Bank as part of the Food for Fashion initiative in partnership with Big Y World Class Market and their annual Sack Hunger program. Cash only donations are accepted with no limit (until supplies last). Those layers of clothes tossed aside on race morning don’t go to waste either! Big blue Goodwill collection bins will be placed near the start lines for donations. Clothes along the course are also collected - last year, 1,700 pounds of clothing from race day was distributed to local charities.